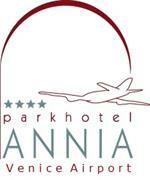 Annia Park Hotel Venice Airport is the ideal choice for those looking for a hotel close to Marco Polo Airport in Venice. Video guarded parking, free shuttle service available 24h / 24h, free WiFi, free shuttle to the bus stop to Venice and the dock where boats leaves in the direction of San Marco Square, islands of Murano, Burano, Torcello. Transfer - on request - for those leaving/departing on a Cruise. Surrounded by a large park that protects the privacy of guests ensuring relaxation and well-being, in this comfortable environment, guests can take advantage of many services, from full breakfast served from 4:30 am with fresh fruit, juices, pastries, savory dishes and much more....to the summer terrace; conference room and private parking also available for longer stays. Completely soundproof rooms, furbished with hardwood floors, shower or bathtub, LCD TV, Tea & Coffee maker, mini bar, slippers, bathrobe; an oasis of calm in the hustle and bustle of an Airport.